Less than THREE WEEKS. I can hardly believe it. The Faithwriters' Christian Writing Conference will be absolutely wonderful. Can't wait for food, fun, fellowship, relaxation, and tons and tons of learning about my craft. Today, I'm talking especially to you folks who need some rest and relaxation (and restoration!) --who feel like they need to get away from the rat race and get some "chill time." Today, I'm gonna talk a bit about the hotel accommodations. 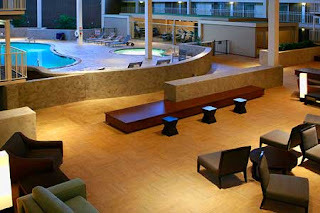 The conference, just like two years ago, will be held at the Radisson in Livonia, Michigan. Those of us who attended the conference a couple years ago may remember the "dust" of this place--which was under renovation. The pool and most of the other amenities were closed. Thankfully, the restoration has been completed, and all the amenities are accessible. Each room has high-speed wireless internet access (and as computer folks, who DOESN'T look for that? ), a spacious work desk for those bits of writing inspiration that might hit at any time, and a Sleep Number(r) bed (which from what my friends tell me, is worth the cost in and of itself!). And then, of course, there's the hotel itself. The swimming pool is available, as well as a hot tub (I'll be there - trust me!!). There's even a fitness center for those of you who want to get a bit of exercise in. Oh - and I haven't even mentioned the pool tables (used to LOVE that game when I was in college! Looking forward to seeing how rusty I am). And the BEST part? It's reasonably priced! Just call the Radisson and you can get a room in the Faithwriters' block for only $93 a night. Personally, I'm staying with three incredible writing friends, so will be paying less than $25 a night! But there is a disclaimer: to get your room in this block, for this price, you need to call the Radisson by July 24 (which just happens to be this coming Friday!). So don't be late. Either number below will work! And don't forget to register for the conference yourself. Are you coming?? Have you registered? Wish I was going! I remember how everyone had so much fun before! Urgent prayer request on my blog for a fellow blogger. This sounds like something I would enjoy. But just moved, have no job or money. Maybe next time. Do they have these conferences in Los Angeles area? That's where I live now. Have a great time. Swimming pool? Translation: bathing suit. AAHHHHHHHHH!